Pictured above, left to right: Paul Sivret, Bill Wiseman, Barbara Ann O’Brien – Bonté Foods, Bobby Dupuis – Physical Education teacher and Pierre Roy – Principal of École Abbey-Landry School. Pictured above, left to right: Nicole Churchill – Chris Brothers, Shelley Reardon – Chris Brothers, Robert Higgins – Chris Brothers, Barbara Ann O’Brien – Chris Brothers, Nay Saadé – United Way, Tristen Black – Chris Brothers and Kayla Keenan – United Way. 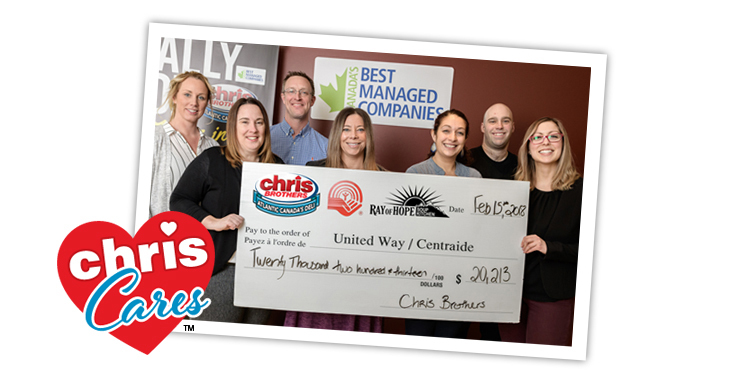 Dieppe based Chris Brothers / Bonté Foods announced a donation of $20,213 to the United Way/Ray of Hope Soup Kitchen. In addition to a $10,000 annual pledge by the company, the company has also matched employee’s contributions for an additional contribution of $10,213! In 2017, the company announced a commitment of $50,000 donation over five years, as well as other support initiatives including employee contributions. The quick thinking of employees and the help of an AED are being credited with saving the life of a Bonté employee who suffered a heart attack on the job. Shelley Steeves of Global News reports. Click on the photo for the video link. Pictured above left to right; Mike Gosselin – Senior Maintenance Manager, Mike Whittaker – President, Nicole Churchill – Vice President of Food Safety, and Barbara Ann O’Brien – Executive Vice President. 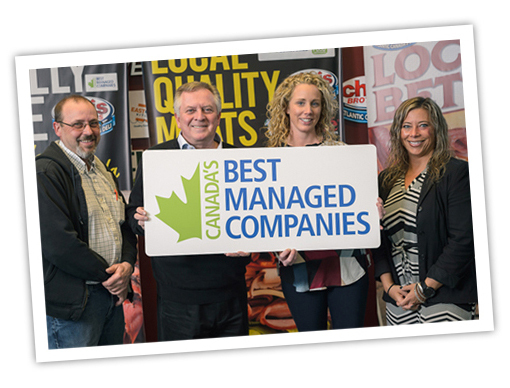 Dieppe based Bonté Foods, processor of gluten free Chris Brothers luncheon meats has been chosen as one of Deloitte’s Canada’s Best Managed Companies. The designation was officially awarded to Trucorp Investments Limited, Bonté’s parent company last week. Pictured above left to right; Barbara Ann O’Brien – Chris Brothers, Nay Saade – United Way, Greg Fennell – Ray of Hope Soup Kitchen, David Small – Ray of Hope Soup Kitchen, Nicole Churchill – Chris Brothers, and Debbie McInnis – United Way. 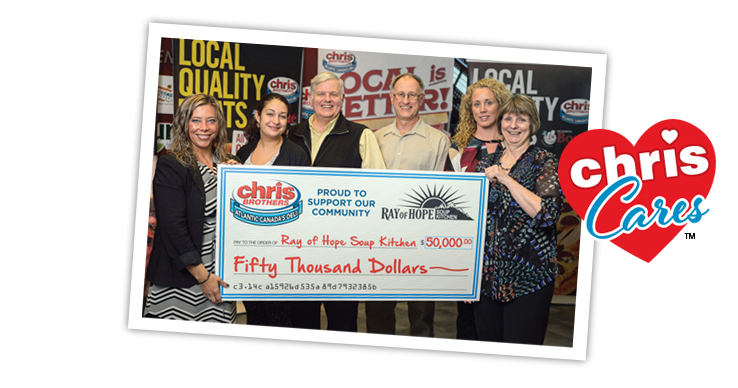 Dieppe based Chris Brothers/Bonté Foods announced they are committing a $50,000 donation to the Ray of Hope Soup Kitchen as well as other support initiatives. The commitment will be a $10,000 annual donation over five years. Bonté Foods of Dieppe was the big winner at the Greater Moncton Chamber of Commerce Business Excellence Awards Thursday night.